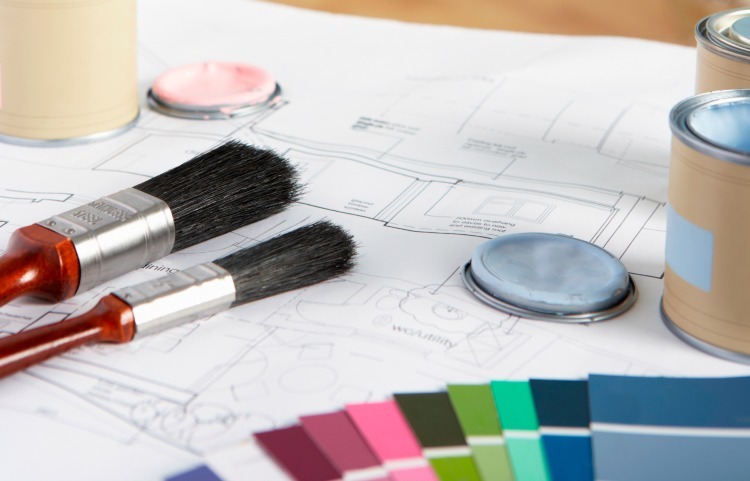 If you are preparing to paint something whether it be a furniture piece, wall, or entire room, you will notice that you have several paint finishes to choose from. Regardless of the color you choose, you will have to decide between a few choices… satin, eggshell, semi gloss, or flat. These choices might overwhelm you and you might be tempted to just pick something, anything, but you should know the finish you choose can greatly affect your finished product. 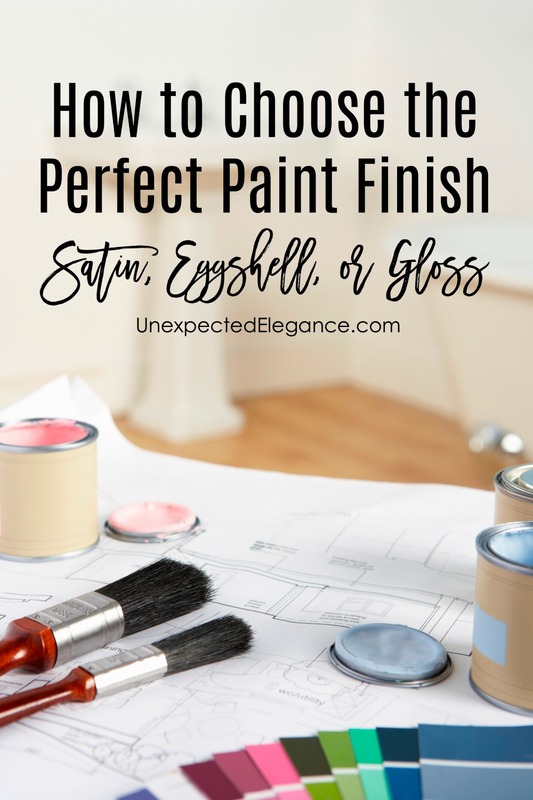 Instead, look below at how to choose the perfect paint finish, so you can be sure you pick the perfect finish for the project at hand! Flat paint is matte paint void of any shine or sheen. Flat paint has a rougher feel when touched and is not as smooth either. Flat paint does not wash well and might stain if it gets damp. So why would anyone use flat paint? Many people prefer flat paint on ceilings as it offers a clean look without shine. For people who like to paint furniture with vintage appeal, lightly sanded flat paint gives them this look. So when it flat paint out of the question? On walls in high traffic areas. They will get dirty fast and will not wash well. As far as glossiness, eggshell comes after flat. It has a bit more shine and sheen to it but is far from high gloss. Eggshell is wipeable as well, making it a better option for walls or furniture pieces you anticipate having to wash. You will find that eggshell is quite durable, and the color looks true to the sample when dry. So when it eggshell paint a good idea? It is ideal for adult rooms and spaces where you want a touch of color without a ton of shine. Adult rooms are ideal because while you can scrub eggshell paint, it isn’t as easy to clean as a gloss is. When should eggshell finish be avoided? You should not use eggshell paint in kitchens, as it won’t clean up well. As we climb the gloss scale, satin finish comes next. Satin is the perfect combination of durability and clean-ability! Satin paint offers rich color, a durable finish, and a nice sheen. It can be scrubbed, and is ideal for higher traffic areas such as living rooms, family rooms, and bathrooms. When should satin be avoided? If you want to paint furniture pieces, satin isn’t always advised. Unless the piece is sanded well the sheen in the satin paint may bring out all of the little defects and flaws. Semi gloss paint is the glossiest, shiniest of all of the paint finishes. You can often find it in semi gloss and even high gloss depending on your needs. The finish of semi gloss tends is very easy to clean, wipeable, and it repels liquids nicely avoiding stains. Semi gloss is great for high traffic areas such as hallways where hands touch the walls often. So when should semi gloss be avoided? Semi gloss will amplify every flaw in your wall. If you own an older home or your walls are in rough shape, semi gloss may not be ideal. The gloss will draw light to the cracks, dents, and flaws in the wall and can actually bring them out instead of hide them. Choosing a paint finish doesn’t have to be tricky. Instead, consider these reasons why each paint finish is beneficial and why it should be avoided. Hopefully this information can help you make an educated choice when it comes to choosing paint finishes so you can get the finish perfect for you!